Jaffna Peninsula, A geographically important location, where great kings ruled, a place of greatest minds and a place where culture and traditions thrived, a place nurtured music and arts. Kolam, Placing the spotlight on a craft which is unique to the Jaffna peninsula, Founded by contemporary artists T Shanaathanan and Pradeep Thalawatta in collaboration with graduates from the Art & Design Unit of the University of Jaffna – Catharina Danial, Mano Prashath, Nirojan Geetha, Shironi Joseph, Suntharam Anojan and Vincent Vimal. All their efforts of reincarnating the age-old crafts and traditions, documenting the invaluable artistic culture, social and community empowerment are funded by the Manithaneyam Trust. We thank you all the donors for making this much-needed project a success and we request continues support to uplift the livelihood of our motherland. 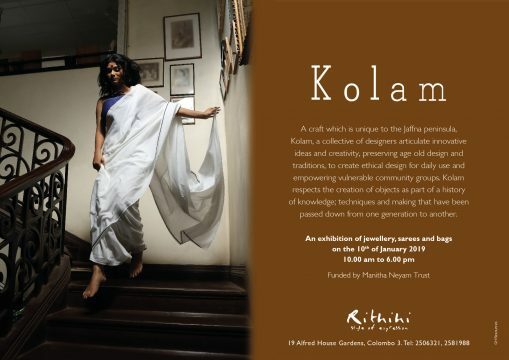 Kolam’s inaugural launch took place at Colombo and the products received very good feedback and the consumer interest was overwhelming.